My blog is Everything-Everywhere.com, a travel blog that documents my travels and photography from around the world. I have been blogging since early 2007 when I started my travels. Since then I have visited over 60 countries and have gained a following of over 3,250 subscribers and 66,000 Twitter followers. I’ve appeared in many major news outlets including CNN.com, and MSNBC.com. As far as I know, my travel blog is the most popular travelogue on the internet…until Ashton Kucher starts one. I had a personal blog before they were called blogs. I started it back in 1998 and used it for a number of things including a streamcast server and a trip around the world I took in 1999 for business. I also ran a popular gaming website network from 1999-2003, but I never considered it a blog even thought that is probably would it would be called today. 1) Be paitient. Your site isn’t going to become an overnight sensation. Expect to take a year or more to really pick up an audience. My site has only been around for two years and I’ve already seen many sites come and go because people just lose interest and give up. 2) Have a plan. Don’t do things without a reason. Set goals and outline ways you are going to achieve them. 3) Adapt. Being willing to change things if they aren’t working. Pay attention to your stats without obsessing over them every day. Look at deeper stats beyond the raw numbers. Look at where people come from and what they read, not just how many there are. 4) Think for yourself. Don’t mindlessly do what all the blogging experts say. Most of them have no blogging experience outside of their blogging advice blog. Every niche has things about it which are unique. Find out what those are for you and plan accordingly. They send out mass emails that show they have never even looked at my website. They get marked as spam and they lose any opportunity to contact me again. Advertisers need to think beyond just running banner ads and trying to buy paid links. There is a lot of room for creativity and experimentation with bloggers, yet few people bother to do so. Lifestyle blogs. The first big niches were in the technology and internet fields. This is because the audience was 100% online, not because they were big niches. The potential audience for home decoration, travel, cooking (all the things you see cable channels devoted to) dwarfs the potential audience for what are currently considered A-List blogs. Think of this as the Oprah or Martha Stewart effect. Their audiences are enormous, but not that web savvy compared to the readers of Techcrunch. Go to a magazine stand and look at what is popular. Those are all niches where advertisers are spending real money, but haven’t found enormous success in blogging yet…at least compared to technology, politics or gossip blogs. I also think that video podcasting is the future. I’ll be back in the US briefly this year and when I head out again, my plans are to focus more on podcasting in the future. Advertisers are doing very little to be creative with bloggers. The only real innovation I’ve seen is with certain ad formats on large sites like the New York Times. They are wracking their brains over how to do something as simple as use Twitter. I don’t know. I don’t think I’m so self important that I can save the world. I suppose sharing my experiences in other places with a wide audience might do something to make people understand each other a little better. I have three dimples on my cheeks and I got a tattoo in Rarotonga. I don’t have one. I almost always read non-fiction and it is very hard to pin down a “favorite”. A lot of podcasts, history audiobooks, a sample of my travel photos, and a ton of Philip Glass music. My blog is at Everything-Everywhere.com and I am on Twitter @EverywhereTrip. All other contact information can be found on my blog. It is hard to attend events when you are constantly traveling. Scott Kurtz (PVPonline.com): A long time friend and one of the best cartoonists on the web. 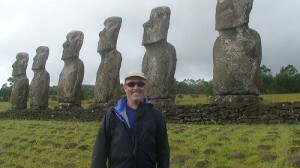 Brent Roundsville (Amtrekker.com): He went around the country trying to finish a list of 50 things he wanted to do. Great video podcaster. Craig Martin (IndieTravelPodcast.com): He and his wife Linda have produced a wonderful travel podcast from the road for the last several years. Matt Kenpens (NomadicMatt.com): I met Matt in Bangkok and he also runs a travel blog and well as working in the travel SEO space. Pete Carey (CareyAdventures.com): A fellow travel photographer who also serves up great daily travel photography. Chris Christensen (AmateurTraveler.com): Another podcaster with a long running, popular travel podcast focusing on great places to visit. Wendy Perrin and Christopher Elliott: They are some of the few mainstream journalists in the travel niche who get the internet. Subscribe to my blog and tell their friends about it.